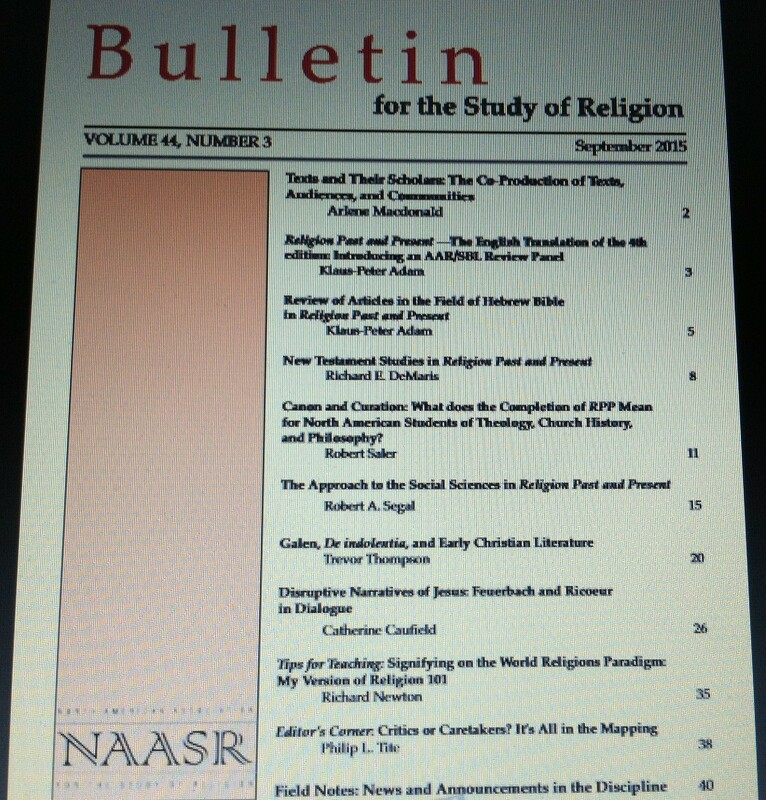 The following is the editorial introduction to the September 2015 issue of the Bulletin for the Study of Religion (the full table of contents having already been posted), written by our managing editor Arlene Macdonald (University of Texas Medical Branch). We offer this editorial here on the blog in order to give readers an overview of the most recent issue of the Bulletin. This issue of the Bulletin considers a multiplicity of texts. Taken collectively, the issue is an extended deliberation on how we as readers and as scholars should interpret, assess, employ, and consume the written words that figure as our objects of study, our modes of scholarly transmission, and our scaffolds of scholarly community. While textual analysis has long been a staple of the discipline, what Matthew Engelke (2010) labels “a media turn” in religious studies has brought new insights to bear on our notions of “texts.” What counts as a “text,” what brings a text into being, what material form a text takes, what divine presences or absences it mediates, what allows it to circulate (or not), what audience(s) it addresses, what practices it facilitates . . . such are the questions posed by a materialist orientation and an understanding of religion as mediation, as “a set of practices and ideas that cannot be understood without the middle grounds that substantiate them” (Engelke 2010, 371). Encyclopedic ventures such as the 4th edition (and first English translation) of Religion Past and Present address their audiences with the weightiness of both history and volumosity, but also with the specificity of what Klaus-Peter Adam describes as “a legacy of nineteenth-century German theology, exegesis, and religious studies.” Adam, Richard DeMaris, Robert Saler, and Robert Segal reflect on the success of this text’s address to audiences rooted in North American scholarly traditions (Adam), to audiences shaped by different disciplinary affiliations (Segal), to theological audiences suspicious of canons and curation (Saler), and to religious studies audiences suspicious of an overweening accent on theology and concomitantly an overweening accent on “texts” themselves (DeMaris). If panels and publicity greeted the recent release of RPP, the texts of Galen of Pergamum (129–ca. 216/217 CE) have only recently been “rediscovered” and “reassembled” after years of relative neglect. Trevor Thompson argues that the works of this renowned physician and philosopher can be profitably used to inform the interpretation of early Christian literature. The extent to which Galen’s texts circulated amongst early Christians or Galen’s familiarity with Christian texts is not the issue here. What Galenic materials and early Christian literatures share, Thompson argues, is not so much textual communities as textual cultures; Galen’s works afford insight into the library and literary culture among Rome’s educated elite, into second century lexical semantics, and into the materiality of texts in the early Christian world. Drawing on phenomenological philosophical hermeneutics, Catherine Caulfield turns our attention from the producers to the readers of texts. Tracking the figure of Jesus through five fictional works, Caulfield makes clear that the “drift” of this familiar figure into new literary spaces potentially generates “an incongruence between the world of the reader and the world of the text” and hence a “surplus of meaning” that subsequently “serves to broaden our understanding of the depth and range of meaning incarnated in this figure.” The meaning of these texts, Caulfield stresses, is being co-created as we, as readers, engage with them. It is particular readers—students—that concern Richard Newton. In this issue’s “Tips for Teaching,” Newton describes his REL101 course, “Signifying Religion: An African American Worldview.” A thoughtful composite of readings, visual media, active learning activities, and class discussion, the course is designed to introduce students to the study of religion in a way that encourages them to critically reflect on the classifications of religion rather than replicate them. Newton’s concern to equip and produce a particular kind of student—one who is prepared to interrogate religion’s taken for granted discursive map—is a normative concern. It is the normative concerns of the discipline at large, furthermore, that preoccupy editor Philip Tite in the “Editor’s Corner” feature that closes this issue of the Bulletin. Following the echoes of Russell McCutcheon’s influential book Critics Not Caretakers: Redescribing the Public Study of Religion (2001) through a proliferation of new textual forms (blogs, podcasts), Tite argues that debating normative claims about who we should be as scholars of religion is part and parcel of our work as scholars. Scholarly texts, teaching texts, fictional texts, ancient texts, electronic texts: it is the production, circulation, and practiced engagement of this material stratum that forms our scholarly community. Engelke, Matthew. 2010. “Religion and the Media Turn: A Review Essay.” American Ethnologist, 37: 371–79. http://dx.doi.org/10.1111/j.1548-1425.2010.01261.x. McCutcheon, Russell T. 2001. Critics Not Caretakers: Redescribing the Public Study of Religion. Albany, NY: SUNY Press. This entry was posted in Uncategorized and tagged Academy, American Academy of Religion, Announcements, Annual Meeting, Arlene Macdonald, Bulletin for the Study of Religion, Caretakers, Christianity, Critics, De indolentia, Editor's Corner, Feurbach, Field notes, Galen, Hebrew Bible scholarship, Klaus Peter Adam, NAASR, New Testament scholarship, North American Association for the Study of Religion, Paul Ricoeur, pedagogy, Philip L. Tite, Philosophy of Religion, Religion, religion and popular culture, Religion and Society, Religion and Theory, Religion Past and Present, religious studies, Richard Newton, Ricoeur, Robert A. Segal, Robert Saler, Russell McCutcheon, SBL, scholarship, Sociology of Religion, teaching, Theory and Method and tagged AAR, Trevor Wade Thompson, world religions, world religions paradigm. Bookmark the permalink.